The Lymphedema Association of Manitoba (LAM) is a patient focused, non-profit organization founded in 2011. Lymphedema Association of Manitoba is an organization in the pursuit of resources, information, education and awareness, and support for those affected with or at risk of primary or secondary lymphedema; their families, health care professionals and the general public. The LAM will work to ensure all who are impacted by lymphedema have equal access to appropriate resources. Our organization is providing education and awareness of lymphedema to the general public and the medical community. 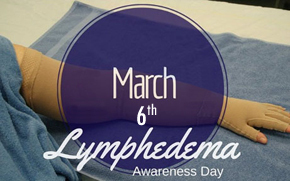 March 6th is Lymphedema Awareness Day. Through the hard work of our founding members, Manitoba has declared March 6th on an annual basis since 2013 when it was proclaimed by Theresa Oswald, the Minister of Health at the time. LAM would like to acknowledge the support of MLA, Wayne Ewasko, who was instrumental in advancing the bill (Bill 209; the Lymphedema Awareness Day Act) which was enacted into legislation in June 2014.